Shown above: A Heath oil-filled ‘cantenna’, Drake W-4 directional wattmeter, Drake TR-4B and a Heath HD-1410 keyer that I’m pretty sure I built for the club from a kit (Heathkit). Reduction of Telephone Interference that I presented at the 1999 Dakota Division Convention here in Watertown, SD. 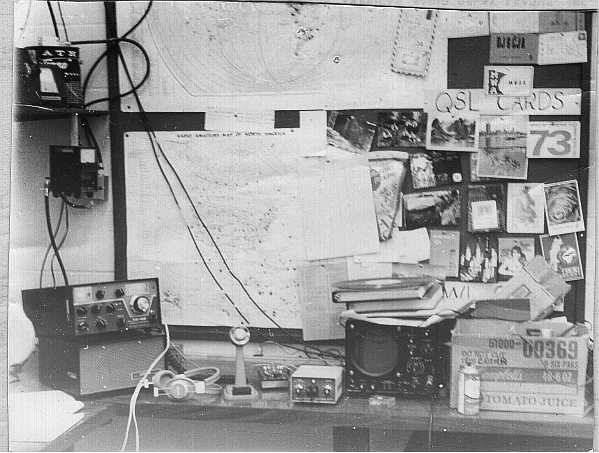 A fellow ham buddy and I used to own a repeater in the late 70’s. We had a local radio announcer with a nice voice create an audio ID for N0DL Repeater. There weren’t too many repeaters with voice IDs back then so the repeater was frequently ‘kerchunked’. Because I can’t find it anywhere else on the ‘net, the OCR’d PDF of the 1994 EIA Source and Date Code Book listing transformer and capacitor manufacturers as of that year. Here is a plain scanned version if you find my OCR version doesn’t display properly. I also found and OCR-scanned the EIA 1995 Source and Date Code Book. Link to additional years of the EIA Source and Date Code book. Good article on inductance of gapped ferrite cores: Evaluation of Several Factors Affecting Inductance Measurements of Ferrite Components by Barbara Ann Livermore and Jan M van der Poel. Audio Tech Types: JVC Compulink files viewed using a soundcard.